I got to the pub for the draw early and there seems to be more and more cars outside every week! 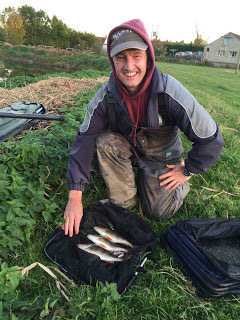 We were up to 15 anglers this week, which is great to see, Paul Homewood, Bob Hammond and the Langport invader, Baz Morgan, were joining us today. 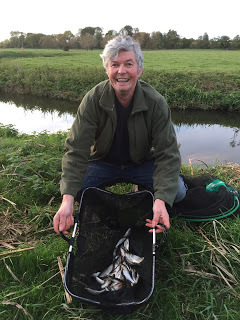 Rob had pegged Redbridge, Isle Brewers and Hambridge with five pegs on each stretch. I was a little surprised Hambridge was in again after it had fished so hard last week but we’d had a fair bit of rain yesterday and I was hoping there would be a tinge of colour in the river today. The landlady, Cindy, drew the golden pegs for today and she pulled out two crackers, last weeks winner, 129 and 109 which wins more than its fair share of matches. I had the last peg in the hat which turned out to be H6 at Hambridge that did 9oz last match, great! To be honest I still quite fancied it, especially if there was some colour and pace on the river. Justin and Gordon were on the two pegs below me and Harry and Paul had drawn below the bridge which was in for the first time this season. 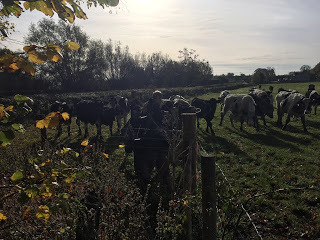 I pulled up in the car park just as Justin was headed off across the field, there was a herd of bullocks in there and they made a beeline for him, crowded around him and he was looking a little nervous. Did I go to help him? Of course not, but I did shout ‘Rawhide’ and took a few photos! Gordon arrived and between the three of us, we decided that the only way we would be able to fish without having to constantly look over our shoulders and wipe cow poo off our tackle would be to fish from the other bank so we drove back and parked by the bridge. Gordon and Justin were able to get fairly low to the water but I was stuck on top of the bank and could only just reach the water with my landing net! Looking at the river I was amazed at how low and clear it was, it was almost like yesterday’s rain hadn’t happened! I set up a 0.6 gram DH16 and a 1 gram bodied float but couldn’t really see me using the latter as there was no flow at all and the lighter rig just sat there. With hardly any fish topping combined with the clarity of the water and no flow, I just knew we were going to struggle. The start time arrived and I began fishing down the middle at 8.5 metres, feeding casters and maggots slightly upstream and hemp straight out in front of me, I was also firing some casters down the peg to hopefully draw some fish up from Justin’s swim. Gordon was into small fish straight away and Justin was soon off the mark as well whereas I couldn’t get a bite! I tried to my left where it was slightly deeper and started getting the odd tiny gudgeon but although it’s a good sign for the river, I was starting to get sick of the sight of them! After an hour I only had a few small gudgeon and a little chublet and was going nowhere fast. Justin was still catching odd roach on the stick float but a pike had started to make it’s presence known which at least provided me with some entertainment while I was sat there catching not a lot. 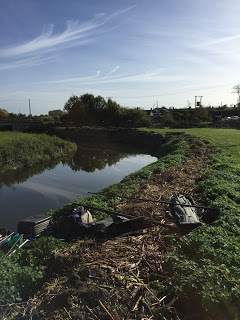 I tried maggot, caster, fishing 11.5 metres to the far bank and down the peg and I even stuck two more sections on and went 14.5 metres upstream and had a dace first chuck but that was it and it was too much like hard work for very little return. The farmer also turned up and moved the cows into another field which at least stopped them sky lining my peg and scaring all my fish! 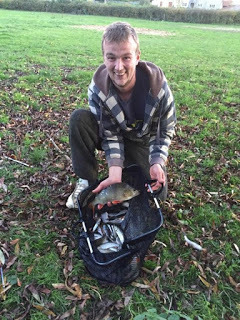 Justin was still catching small fish as was Gordon although he was suffering some pike attacks now as well. I hadn’t seen any pike as yet, mind you, they would probably starve to death in my swim! With two thirds of the match gone, I only had a handful of tiny fish that wouldn’t weigh a pound and the only reason I was still there was the possibility that a few chub might show up and save the day. Another thirty minutes passed and I was going through the motions a bit when I laid the rig in and before it had even settled, the float slid away and the strike resulted in a fair bit of my new Drennan Aqua elastic streaming from the pole tip. I initially thought chub but it turned out to be a nice perch about 8-10oz and very welcome all the same. 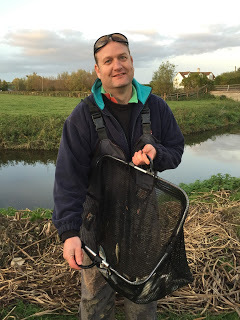 I would like to report I bagged up for the remainder of the match but that didn’t happen although I did have two more perch of a similar size plus a few more small fish so my final tally wasn’t too embarrassing. Justin soon arrived with the scales and my fish weighed 2lb 3oz, Justin had a lot of small fish for 3lb 3oz and Gordon had a similar catch weighing 2lb 11oz and I thought they both had a lot more than that. So it had been hard going on our side of the bridge, it was a different story downstream though as Paul Homewood had a cracking net of fish weighing 15lb 6oz on the whip which included six nice perch and Harry Hebditch also had a nice days fishing with 8lb 14oz, Harry had some nice perch but also lost a big chub at the net (thanks to Harry for the photos). 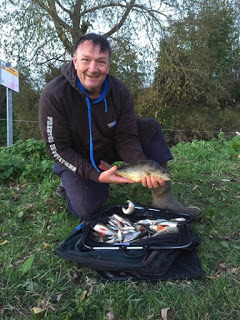 Back at the results and Steve Parker had the top weight at Isle Brewers with 11lb 8oz from peg 120 which meant Paul had won, it also meant the golden peg fund was safe as Bruce and Rob had struggled in pegs 129 and 109. Heardy had the next best weight there with 8lb 2oz from 128 and Fieldy had the best weight at Redbridge with 6lb 1oz from 110. My poor run continues so come back next week to see if I can do any better, I couldn’t believe how low and clear the river was today and its still in desperate need of more rain. I was really looking forward to this weeks episode of The Big Fish on BBC2 where they headed to Laos but to be honest it was the worst one yet! They caught very little and the contestants seemed to spend the entire time falling out of boats, getting snagged up and breaking rods. One women in particular missed two of the tasks because of heat stroke but when she returned for the final challenge, bearing in mind she was in grave danger of being sent home, she ended up sat in the river trying to catch fish in her hat! Disappointing given that she’s been afforded an opportunity most anglers would kill for, she didn’t even make for good telly in the previous two episodes! Next week they are in Costa Rica which looks amazing and if the trailer is anything to go by they actually catch some fish as well. LOL. Reminds me of the bullocks at South Bradon (opposite the bungalow). They're absolute nutters and go mental when you walk through the field. Ha ha, they can be a nightmare, have you fished there recently? What's it fishing like? Haven't actually got my ticket yet this year. Going to get it soon. I've only fished that area for chub in the past and caught the odd one. 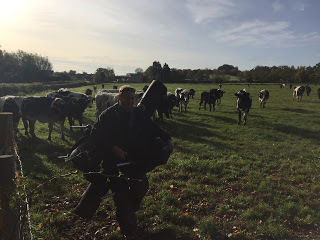 Never fished that field because of the cows……. I remember you writing in the past that the homeowner gives you grief if you fish opposite the garden! Yes he can be a bit of a nightmare but we haven't been down there for a while so maybe he's mellowed!! !